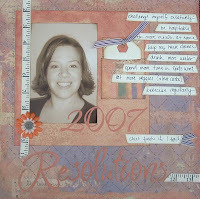 Did you resolve to learn or try something new in 2007? We're currently putting together our Winter class schedule here, brainstorming & trying to figure out what YOU would like to see! So, I have a favour to ask of you, our customers, please let us know what sort of classes you would like to see offered in our store this winter (or even for spring)! As an incentive & thanks for your input, if we use your class suggestion you can take the class for FREE (or up to $18 off). This should benefit us all :) We look forward to hearing from you! Either post your ideas here or e-mail us directly at creativeaccents@telus.net Thanks! There won't be a ton of classes in January, but we'll start off with a Resolutions class next Tuesday, January 16. Bring a photo of yourself (yes, of YOU! If you don't have one, we can take one!) and a list of your new years resolutions! This fun class is a great opportunity for you to try out the NEW QuicKutz Revolution dies (and hopefully the tool will have arrived by then, too!) I'm loving the 'Journal' alphabet, library pocket & tag :) This is actually the first time I have ever written down my resolutions (let alone post them online & in the store for the world to see!) and I'm convinced that creating a layout about them will help me be more accountable to them!